Toronto's Old City Hall is beautiful with its ornate architecture. The Old City Hall sits next to a modern glass building. The glass building's modern architecture is plain in its detail. Beautiful layers of stone of the city hall stand out to the simple lines of the glass building. 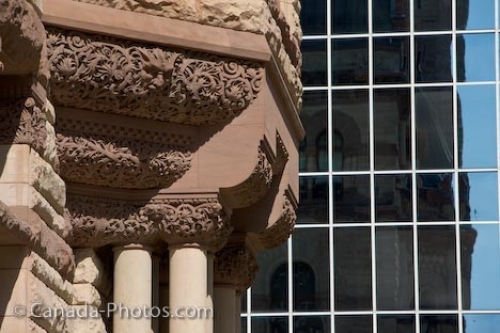 Facade of the Old City Hall beside a modern glass building in downtown Toronto, Ontario, Canada.